I know that looks like a fat Roman numeral I but it's a blurry Roman numeral II. Trust me. What did I eat? Well, who says a restaurant review has to tell you what was eaten? I’m breaking new ground here. Mostly because I don’t remember. Because what happened was, as I stood there trying to choose from the amazing collection of items in steam trays before me, the owner, who was so into it that I had sought out his restaurant after finding it on the Internet, threw a bunch of different things into the container so that I could try a vast array of his creations. They were Caribbean items that included things like plantains, yams and fake meats. And they were all amazing. 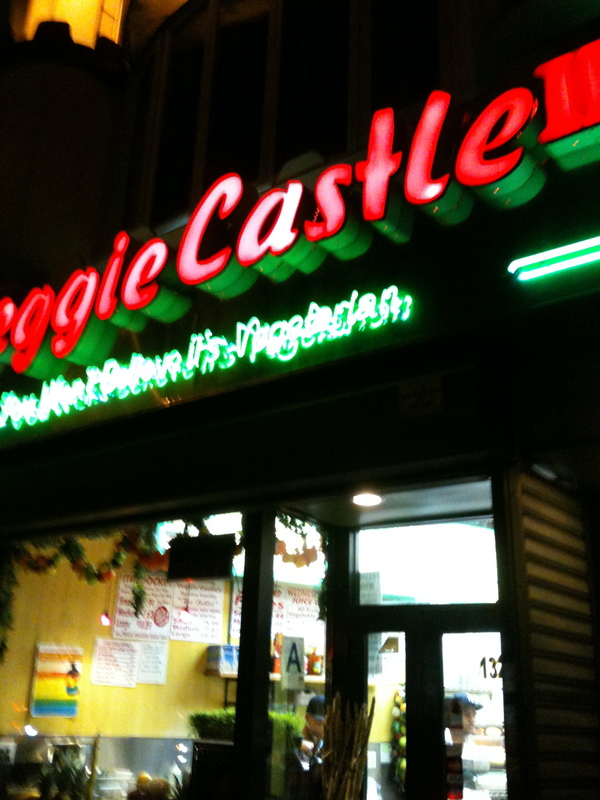 And… and this is not a small and… they carry Vegan Treats straight outta Bethlehem! After seeing constant references to this beloved bakery I of course had to try some. I got four different slices of cake and, here’s the best part, when I got to Jersey nobody wanted to share them! (So what if I ate four pieces of cake over two days, it’s allowed when you leave your home state.) And yes, they were good. Better than the bestest vegan dessert ever? Don’t know that I’d say yes. But I’m looking forward to a re-match, especially if I can get my hands on some of those peanut butter bombs one day. By the time I got there, about five minutes before their stated 9 a.m. opening, there was already a line! And I’m guessing it wasn’t just vegans lining up at the gates of food truck heaven though I have to admit I didn’t do a survey. This was pretty exciting. I’d read a lot about this place online, and this was before they got permission to start hitting the streets of New York, so the whole thing seemed kind of legendary and — how often can you say this and mean it — it did not dissapoint. The special of the day, which I was told will become a regular menu item this spring, was the Ancho Chili Seitan Burger and it is THE BEST VEGAN THING I HAVE EVER EATEN. And really, I wouldn’t even have a problem taking the word vegan out of that sentence. It destroyed. To the point that after taking a bite in the car I had to go back to the truck to tell them just how incredible it was. So to all you New Yorkers who have been too lazy to tube it over to Hoboken: go see what the fuss is all about! And then cry for me that I live 3,000 miles from it. At the wedding I had a terrific, and I’m not overhyping this, vegetable napoleon. If you’d gotten this at any vegan restaurant, even a pricey one, you’d have been very happy with it. Even better, after my niece told me she’d make sure they’d have something I could eat, she had them put it on the menu card. So hopefully this led some other people to get it instead of the chicken or salmon. 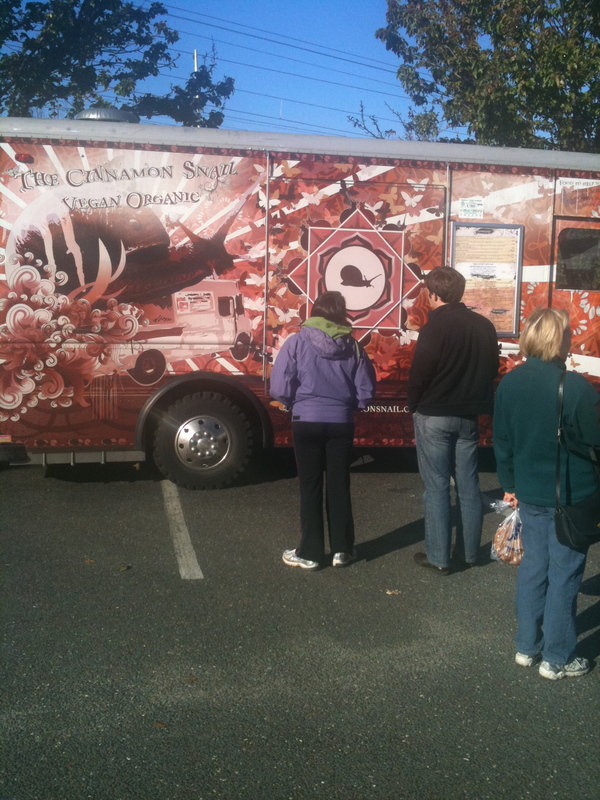 I’m so happy to hear you’re a fan of the Cinnamon Snail as well, albeit from across the country (sniffle sniffle). One day I will make it down to Orange County to try the Seabirds truck and see how they compare (not that it’s a competition). Thnx for reading!